In my dream I decided to legally change my name to Clairey the Observer. And in my dream this was my job (my dream job! ), I was a professional observer. I just sat back and watched people and then I wrote about it. I made observations. I half-woke up and thought about what a nice job this would be in real life, I imagined myself on a high perch, taking notice of all that happened around me, and I thought about writing stories based on observations of people. I want this job! Unfortunately I didn’t dream about the part where you apply for the position, so I don’t know how to go about it. But then when I was fully-woken up, I looked up “observe” in the OED, as one does, so I’d be fully apprised of the job description before I undertake the employment. Observe. It’s such a rich and fascinating word. According to my understanding of the term in my dream, my main responsibility as an observer would be “To take notice of, be conscious of; to notice, perceive, see.” And then “To remark or make observations on.” If I was actually applying for this job, I would write in my cover letter, “I think I would be very good at taking notice and being conscious of things, because it’s very important to me to notice things, and not to just let them pass me by. I want to observe things and collect and keep them, and not just let life wash over me as though I was in a sleepy stupor. I want to be a keen observer, and notice even the small things and feel them, too.” Further duties of an observer would include acting “To watch over, look after, keep safe.” And I feel confidant that I could do this very ably. Just ask my dog or my sons, if anything I’m likely to keep too close a watch and generally look after too fondly and anxiously. I also understand that as an observer I might be called upon to abide by or adhere to or to maintain or uphold a mode of existence, a covenant, or a promise, and I assure you that in my day-to-day existence, I will strive to observe principles of curiosity, creativity, generosity, honesty, and, of course, verbosity and I will faithfully observe such small daily rituals as necessary to ensure a life fully lived and thoughtfully observed, as far as I am able. In summation, I would like to share the words of Francis Bacon, “If men will intend to observe, they shall finde much worthy to observe.” I hope that you will consider me for this position of observer, howsoever it shall be found and remunerated, yours sincerely and henceforth, Clairey the Observer. Malcolm picked out some tofu at the grocery store. I only like tofu when it’s fried very crispy, and I don’t like the way my kitchen smells when I do that at home. So I had the bright idea to take it to work and ask the chef to put it in the fryer for a few minutes. And he very very kindly agreed, for which I am eternally grateful. I brought it home, and Malcolm and I made a sauce for it, consisting of tamari, honey, balsamic, and a bit of ginger. I decided to use this same treatment on some black beans, and pile these on some broccoli rabe as a backdrop for the tofu, so that is what we did. Quick and simple meal, but quite tasty, too. You could use broccoli instead of broccoli rabe, and just add it to the beans and cook until bright and tender. Here’s Niney and the Observers with Blood and Fire. One block of extra firm tofu. If you’re doing this at home, drain the tofu, and place it on a plate with another plate over it, and weigh it down, with some cans of beans, say, to squeeze out the extra liquid. Cut it into small cubes. Warm some olive oil in a wok, and fry in small batches till crispy. Set on a towel to drain. One bunch broccoli rabe, trimmed and boiled in salted water until tender and bright green. Drain and mix with a little butter, lemon, salt and pepper. In a large skillet over medium heat, warm the olive oil. Add the shallot and garlic, and stir and fry for a minute or two. Add the pepper flakes, tamari, honey and balsamic, stir to combine, and then add the black beans and ginger. Add enough water to make it nice and saucy. Bring to a boil. Season with salt and pepper. Serve over broccoli rabe, and scatter tofu on top. This would be good with basmati rice. 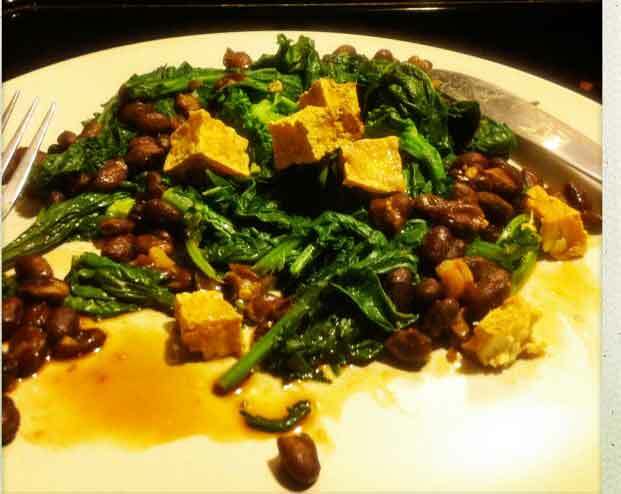 This entry was posted in beans, recipe, Uncategorized and tagged black beans and tamari, broccoli rabe, quick dinner, tofu by Claire. Bookmark the permalink.